Lu par : Stephen Paul Aulridge Jr.
As we open up to life and love and each other, as we awaken from our dream of separation, we encounter not just the bliss of existence, but its pain, too; not only life's ecstasy, but also its agony. Healing doesn't always feel good or comfortable or even "spiritual", for we are inevitably forced to confront our shadows, fears, and deepest longings - those secret parts of ourselves that we have denied, repressed, or deemed "negative" and unworthy of our love. How can we find the calm in the midst of the storm? How can we rest, even as the ground falls? Falling in Love with Where You Are invites you to discover a deep yes to your life, no matter what you are going through; to see crisis as an opportunity to heal, pain as an intelligent messenger, and your imperfections as perfectly placed. 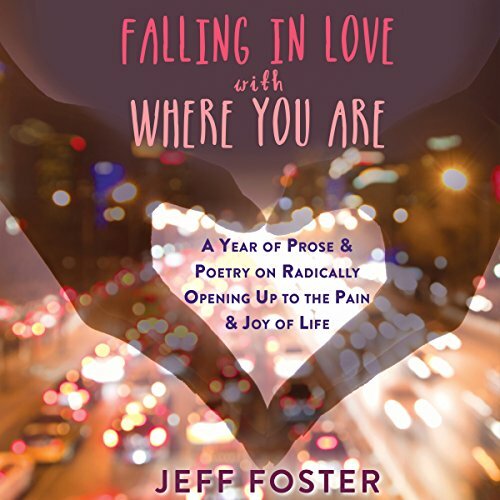 Through his prose and poetry, Jeff Foster will guide, provoke, encourage, and inspire you on your lonely, joyful, and sometimes exhausting journey to the home you never, ever left: the present moment. Jeff writes from a deep well of profound wisdom. felt like it was written especially for me. Best book I've listened to so far. Very practical guide for experiencing peace right now, right where you are in this very moment. kein Ankommen sondern bereits da..
Diese Buch st wie ein Schluck reines, klares Quellwasser, für einen erschöpften, durstigen Wanderer, der sich im Dschungel der Rat- und Tatgeber, in der spirituellen Welt verlaufen hat. Jedes Wort wie auch die Stimme des Sprechers war reinster Balsam für meine Seele. Ich fand mich beim Hören, einige Male auf meinen Knien, in tiefer Dankbarkeit für die Klarheit und Tiefe dieser Botschaft. Nicht's neues und doch ganz anders.... danke Jeff Foster. This book is like a sip of pure, clear spring water, for a tired, thirsty wanderer who has lost his way in the jungle of counselors , in the spiritual world. Every word as well as the voice of the speaker was the purest balm for my soul. I found myself, while listening, a few times on my knees, in deep gratitude for the clarity and depth of this message. Nothing new and yet very different .... thanks Jeff Foster.